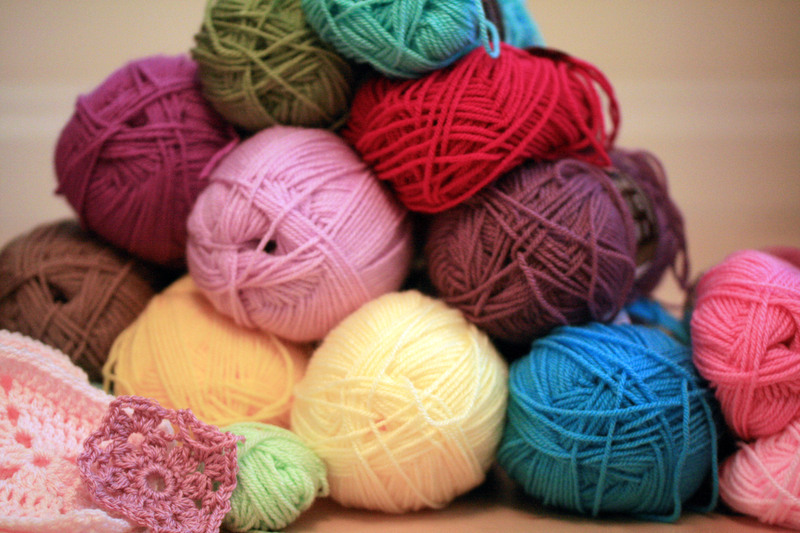 I have been very busy behind the scenes these last couple of weeks but as promised here is my lovely stash of yarn. As you can see I have already been using some of it, I got busy with the blues first…………………. 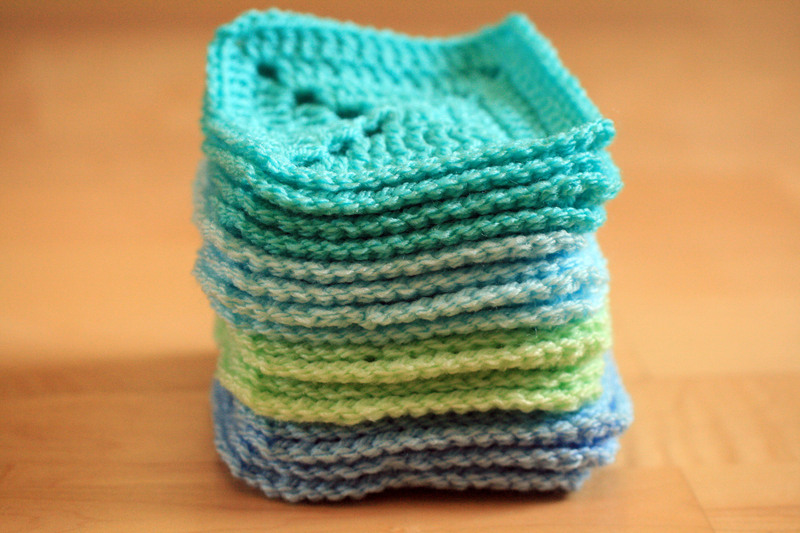 ………………and made this lovely stack of squares for the outer edge of a baby blanket in cool minty blues and greens. I wanted to mix things up a bit and as I love granny squares so much. Then these little beauties for the centrepiece. Here is how I joined them all together. Now to get on with a matching one in Pinks! I am so happy to hear that you are going to make a blanket too. I wish now that I had written out the pattern but sadly I did’t. 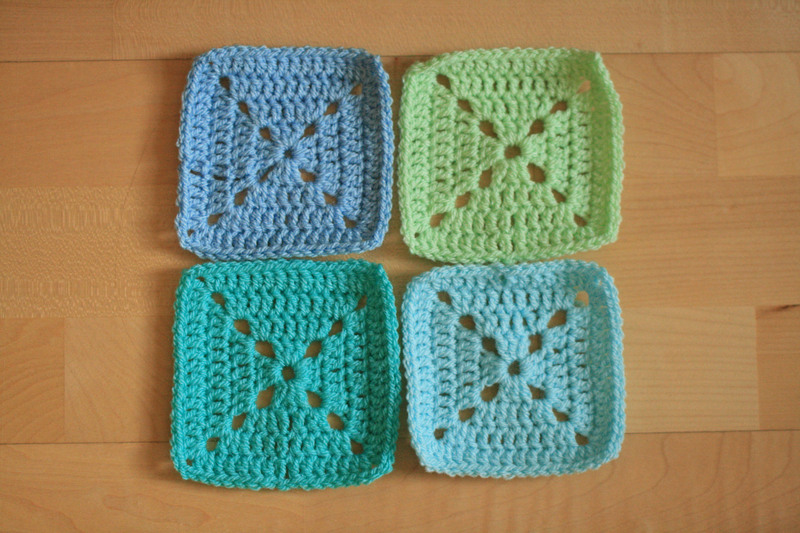 I will email you the pattern for the centre squares and will happily answer any queries you have. I used Stylecraft Special DK, this is a a really nice soft yarn that I use for lots of projects. From memory I didn’t use a full ball of any of the colours so one of each of your chosen colours should be fine. I hope this information helps. I have just found your wonderful blanket. Please can you email me instruction for center squares – I really want make this. Thank you so much. I sent an email sent with the pattern attached, please let me know if you don’t receive it oe have any problems, thanks for visiting my blog. Is it possible to get the pattern for this? it’s beautiful, i’d love to try and make one. Thank you, I am honoured that you would like to make one too, sadly I never wrote a pattern for these blankets but the squares are mostly granny squares which I am sure you can do. 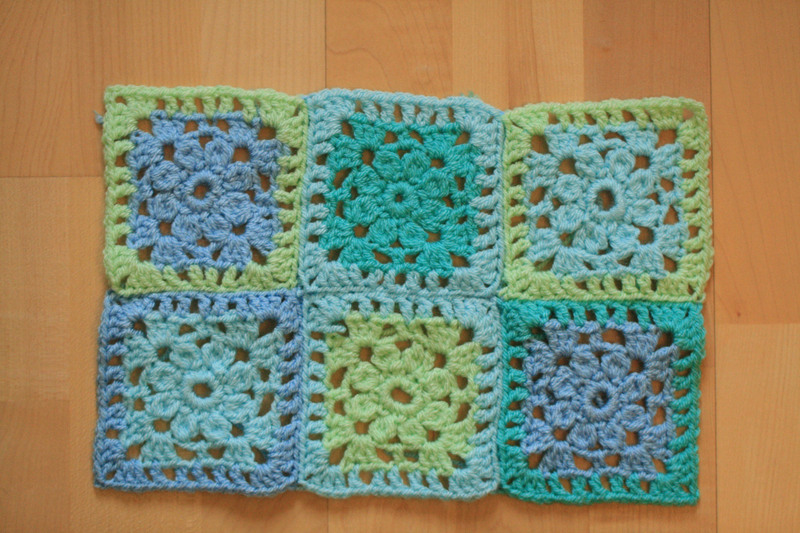 i have written the pattern for the centre squares that i can email to you if you would like. I have emailed it to you and hope that it helps. I love these colours. Very nice blanket. Thank you so much for visiting and leaving your lovely comment. Look forward to seeing you again soon. can you share the pattern for little beauties for the centrepiece? Yes of course, I will make time this weekend to do it for you if thats ok.
HI, I am a beginner in crocheting, I would like to ask what’s the size of your granny squares and your blankets ? is it a 4 ply yarn? what needle size in mm that u use? I love your colour palette too and so as your blog! Thanks for taking time answering my question! Welcome to the world of crochet, I hope you enjoy it as much as I do. The squares on this blanket are 4 inch squares worked in Stylecraft DK using a 4.50mm crochet hook. So pleased that you liked my blog and hope that you will come again soon. If you have any more questions please feel free to ask, I am happy to help if I can. What a beautiful blanket. Those colors really look like spring! Thanks for visiting my blog. I look forward to reading more of your posts. 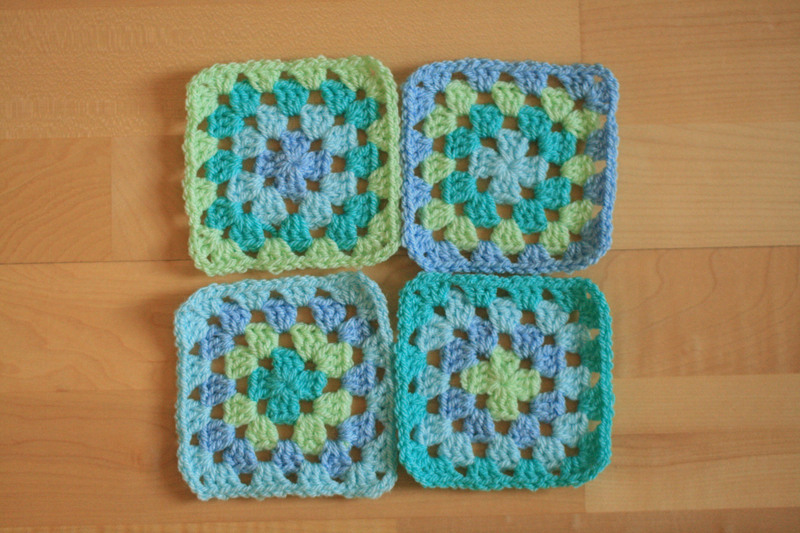 I love, love, love granny squares. Great color palette! Thank you, I love granny squares too. that’s absolutely lovely! I have a square afghan in the works too, though I never thought about mixing squares like this! Lovely- how did you join the squares? I crocheted them together by putting the right sides together and slip stitching through the outer loop of the V shape at the top of each square. I like doing it this way as each square has a defining line around it on the right side. Hope you understand what I mean. Maybe I could do a tutorial if it would help. Do you make blankets too? I have never made a blanket of squares to join together.I am doing a CAL at the moment and I know how I am going to join that one, but I fancy doing one for my grandchild to be so was really admiring yours. A tutorial would be fantastic please. I am picking my daughter up from uni this weekend but I will try and do it in the next couple of weeks if thats ok. Hope you share what you decide to do, I would love to see. When is your grandchild due? I am very envious as I am still waiting for one to appear on the horizon. I keep asking but none of mine are ready yet! The expected grandchild should be with us sometime in October- be Number 3 for me- it’s great! I’d love to do something by then! As I have three sons and two grandsons I am thinking PINK! All babies/children are wonderful but it would be nice for you to work up something in pink, thank you for visiting and stay in touch. Thanks for visiting and commenting on my scarf, I love these colours together and the finished blanket is so lovely. Thank you so much, I really enjoyed working with these colours too. I love it – and so would any new mom and baby. Thank you so much, I have really enjoyed making it. I have just about finished the pink one too so will be posting that shortly. I like this! It looks great. Oh wow! 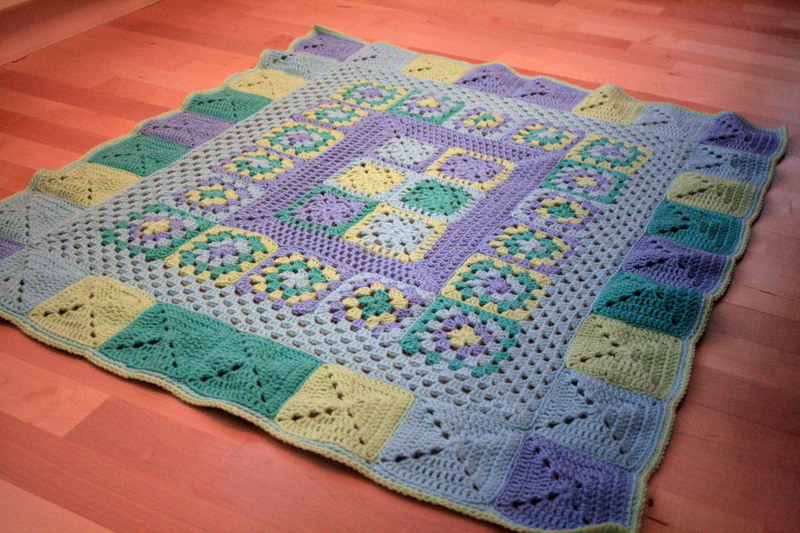 LOVE this granny square blanket! Love the colors and your layout 🙂 Beautiful. It’s so lovely! I’m a bit granny square obsessed too but don’t much enjoy blankets.Very well done! I know what you mean about blankets, boy they take some piecing together! But they are also very rewarding to make. Thank you, I really love my birdhouse, thanks for the speedy delivery! This is lovely! Beautiful colours. And the matching one in pink… Is someone having twins?! Not that I know of but wouldn’t it be lovely!! !